This guide is a work in progress and currently focuses on the base classes of Lumberyard's component entity system. Feel free to let us know which additional documentation you'd like us to prioritize as we expand this guide. Welcome to the Lumberyard C++ API Reference. 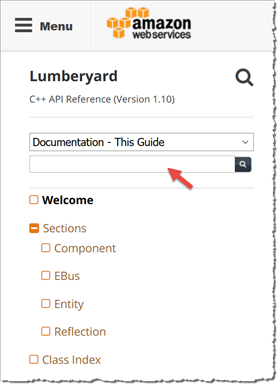 This guide provides C++ API reference documentation for the core code of Lumberyard. If you are working in Lua, see the Component Entity Lua API Reference. Component – A component defines a discrete feature that can be attached to an entity. You can use Lumberyard's components or create your own components. An example of a component is an audio trigger. Event Bus (EBus) – EBuses are a general-purpose communication system that Lumberyard uses to dispatch notifications and receive requests. Components and other classes use EBuses to make and handle requests from each other. An example of an EBus is a light component request bus, which services requests from other components to turn a light on and off. Entity – An entity is an addressable container for a group of components. An example of an entity is a character in your game. Reflection – Reflection is the means by which classes describe the data and functions that they contain. This information can be used for different purposes, such as editing, storage, and controlling run-time behavior. (Recommended) Choose an area from the introduction page. Browse the class index. The class index only lists classes currently covered in this guide. Search by API name. You can type an API name into the search box to see if we have covered that operation yet.